Description: Rise up against slavery with the latest single-player action-adventure game in the Assassin’s Creed® franchise. 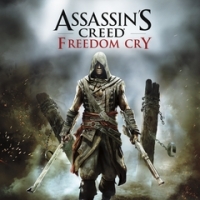 Assassin’s Creed® Freedom Cry is now available exclusively for download on PlayStation®4 system and PlayStation®3 computer entertainment system. Born a slave, Adewale found freedom as a pirate. Now, 15 years after the events of Assassin’s Creed® IV Black Flag™, Adewale has become a trained Assassin. 08-14-2017 beatle1970 Description Rise up against slavery with the latest single-player action-adventure game in the Assassin’s Creed® franchise. Assassin’s Creed® Freedom Cry is now available exclusively for download on PlayStation®4 system and PlayStation®3 computer entertainment system. Born a slave, Adewale found freedom as a pirate. Now, 15 years after the events of Assassin’s Creed® IV Black Flag™, Adewale has become a trained Assassin. After being shipwrecked in what is now known as Haiti and left without weapons or a crew, Adewale starts to assist the locals in an effort to assemble a crew and steal a ship. The more he helps, however, the more he is drawn into the Maroon slave community. Forced to face his past, he sets out to free the slaves and bring death to their captors. This is a list of VGCollect users who have Assassin's Creed: Freedom Cry in their Collection. This is a list of VGCollect users who have Assassin's Creed: Freedom Cry in their Sell List. This is a list of VGCollect users who have Assassin's Creed: Freedom Cry in their Wish List.